All over Italy you can find good Italian food but the north and the south differ in styles and foods. In the south we have what we think of as Italian Cooking. Red sauces, meatballs, pizza and lots of fish. In the north you have veal, white sauces, pizza and more meat. The north also has white truffles! These are a favorite of ours. Black truffles (Italy and France) are good but can’t stand next to a white truffle. They are rare, hard to get and expensive. second in cost only to saffron. Like saffron, you use it as a seasoning. So a small truffle goes a long way. The bars have the best Panini in all of Italy at lunch time. They also have great pastries and coffee for breakfast. Most American’s think of this area as heavy creamy sauces but those are for the tourists. Milano has great pizzas, meat dishes, vegetables and cheeses. 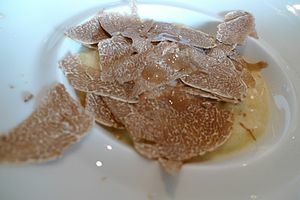 During the end of the year is truffle season and you can get fantastic pasta or veal with white truffles. These are expensive but worth a try. Milan is often overlooked as a tourist destination but We think it’s a great city. It is the fashion capital f the world. It has well dressed people and fashion is everywhere. Sit and try a pizza or a pasta. Visit the Duomo (cathedral), Galleria, and Opera House. Become a Milanese and enjoy life with a glass of wine. See the sales first in Milan. Walk the stores and enjoy the fashion. This is Milan. Milan is also home to a great Leonardo Da Vinci museum, Duomo, the Opera House, the Galleria and the original Da Vinci’s Last Supper in the small church of Santa Maria delle Grazie. Don’t miss these great attractions. Italy is all about food! Each region has its specialties. Don’t miss out on any of it. The north is about truffles, Tuscany is all about meat, Naples is about pasta and pizza and the south is about fish and seafood. Try local wines with whatever you eat. Italian food in Italy is very different (much better) than Italian food in America. It is fresher, no GMOs, cooked to perfection and slightly seasoned (never with heavy sauces). Fetticini Alfredo is not Italian! It was invented by a Roman for Americans. You can find it in Italy in tourist restaurants but most Italians would never eat it. White Truffles – In the north around the Alba area you get this wonderful treat. It is available in the fall. It is served on eggs, veal, pasta and pizza. Pizza – In the north (Milan) it is Pizza Quattro Stagioni (4 seasons) and in the south it is Pizza Margarita (preferably from Naples). Pasta – All types with simple red sauce to fish or vegetables. Done Al Dente and flavorful. Risotto is a wonderful Italian rice dish mostly done in the north. Fresh Fish & Seafood – Especially in the south. It is locally caught and served hours (not days or weeks after it is caught and never frozen). Shell fish is especially great in Italy. Mussels, clams, calamari, octopus, etc. Clams in the south are tiny but so flavorful. Vitello Milanese – Veal Milan style. When George was a meat eater, he loved this dish. It is a pounded flat cutlet with a bone in one end. Fried lightly. Happy Hour – In bars all around Italy you have a happy hour in the early evening. You order a drink and they serve you small plates of food for free. Italians do not like to drink without eating something. Each bar has different dishes. Gelato – Everyone reading this BLOG knows our love of Gelato. A more flavorful, less fat filled ice cream served soft. There are so many flavors you will have to make more trips to Italy to try all of them. Every town has Gelato shops. Chocolate – Italian chocolate comes in dark and milk but is much less sweet and more flavorful than our chocolates. You can find small shops in each town that make the chocolate right there. It is not commercialized. Try it plain, with fruit or nuts. Bread – Italian bread is every bit as good as French bread. They use whole grain non GMO flours and bake it to perfection in a very hot oven. It comes out soft on the inside but hard and crispy on the outside. Pastries – Italian pastries like French pastries are made with real ingredients and butter (never substitutes). The result is flaky crispy crusts with fresh fruits or nuts. Experience Italian food in non tourist restaurants with a glass of local wine. Don’t eat desert in the restaurant but walk a little and find a pastry shop or Gelato shop and enjoy! Italy produces all the world’s white truffles and consumes most of them. Black truffles also grow in Italy and in France. People all over the world have tried to get the prized white truffle to grow without much success. It grows as a fungus (mushroom family) on the roots of certain Oak Trees. Know one knows why the Oak Trees in Alba area of the Piedmont region of Italy can grow such delicious truffles. They are not pretty to look at and their smell will turn off those that have never had them. The taste is divine. Italians shave them very thin over veal or grated on pasta and risotto. They can also be grated over eggs. They are harvested in the fall and there are festivals in the north of Italy to celebrate. We have seen in our news the record-breaking white truffle that was just auctioned off. These little gems are like gold. They grow underground and are very hard to find. Humans can not smell them underground. In days of old, Italians would use pigs to find them. The one BIG problem was the pig! It seems pigs like truffles even more than we do. Can you picture a small Italian farmer fighting a ton sized pig for a truffle? Today they use trained dogs. They can find them just as well as pigs do but won’t eat them. If you are so lucky to be in northern Italy in the fall, get some dish with truffles on it. Make sure they are white truffles and not black ones. We recently bought a truffle in Philadelphia that was overnighted from Italy. It cost $5,280 per pound. No we didn’t spend that much. They are so light that a medium size truffle cost us about $100. They last about a week. We had great food for one week. You can also buy white truffle oil and use it in cooking your dishes or sprinkle it over risotto or pasta dishes. About.com lists some great festivals in May in Italy. My favorite is the risotto festival in the Piedmont town of Sessame which dates back to the 13th century. If you are a risotto fan, as I am, don’t miss this one. Festivals happen all around Italy and in most months. The Italians love life and always find something worth celebrating. If you are planning a trip to Italy in May, look through this list of festivals and see if one is near you. Be Italian while on your trip and enjoy life, food, wine and people. Don’t be afraid to try new things. For the vegetarians and vegans readers out there, Italy is a country of wonderful vegetables. in the markets you can still see the dirt on vegetables. They are fresh and when prepared properly (not over cooked) they are delicious. If you eat fish, Italy has a great variety all very fresh. I was once in a small restaurant in Rome and our waitress apologized that it was taking so long. It seems her dad and brothers were not back with their catch yet. Make sure you save some room for gelato!